Take a vacation to the Blaeberry Valley in Golden, British Columbia and enjoy the trek on horseback through pristine streams and the wilderness area. If you are a rookie at riding a horse, guided tours are available to lead you through some of the most beautiful scenery of the Blaeberry Valley. 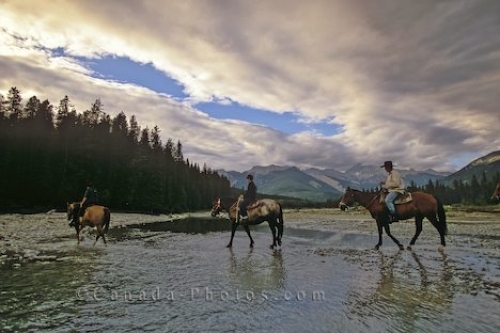 Picture of tourists each riding an individual horse amongst the streams of the Blaeberry Valley in Golden, British Columbia.